TMW taxi service is a great way to get around and see the sights without having to be in the driver's seat. Ideal for commuting from the airport or just to travel from your home or hotel room to a nearby destination. 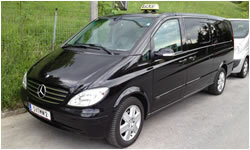 Our taxis are a quick and convenient way to get around town and the surroundings. Choose us and kick your feet up while enjoying Salzburg´s scenery. Our taxis are available up to 8 persons.